We’d love your help. 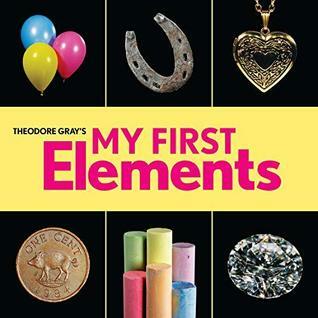 Let us know what’s wrong with this preview of Theodore Gray¿s My First Elements by Theodore Gray. Introduce Baby to the wonderful, colorful elements that make up his or her world! This board book for babies, ages 6 months to 3 years, features big, bold, and bright photography from Theodore Gray's bestselling adult book The Elements, paired with delightful, baby-friendly text. My First Elements includes 10 elements, one per spread. Each spread features a big photograph of the element on one page, such as an iron horseshoe or nugget of gold. The opposite page shows photographs of the places in baby's world where the element is found from balloons for helium to a swimming pool for chlorine to seaweed for iodine. To ask other readers questions about Theodore Gray¿s My First Elements, please sign up. A baby's introduction to the elements and where they can be found. Theodore Gray is the author of 'The Elements' and 'Mad Science: Experiments You Can Do at Home-But Probably Shouldn't', and of Popular Science magazine's 'Gray Matter' column. He is the proprietor of periodictable.com and the creator of the iconic photographic periodic table poster seen in universities, schools, museums, and on TV shows from 'MythBusters' to 'Hannah Montana'. In his other life, he Theodore Gray is the author of 'The Elements' and 'Mad Science: Experiments You Can Do at Home-But Probably Shouldn't', and of Popular Science magazine's 'Gray Matter' column. He is the proprietor of periodictable.com and the creator of the iconic photographic periodic table poster seen in universities, schools, museums, and on TV shows from 'MythBusters' to 'Hannah Montana'. In his other life, he is co-founder of the software company Wolfram Research, creators of the world's leading technical software system, Mathematica®, and WolframlAlphaTM. He lives in Champaign-Urbana, Illinois.